So many people want to be mentioned in Forbes and a great way to guarantee that kind of exposure is to write for Forbes. Aviva Legatt isn’t just a Forbes contributor. She is also one of my media mentoring clients. 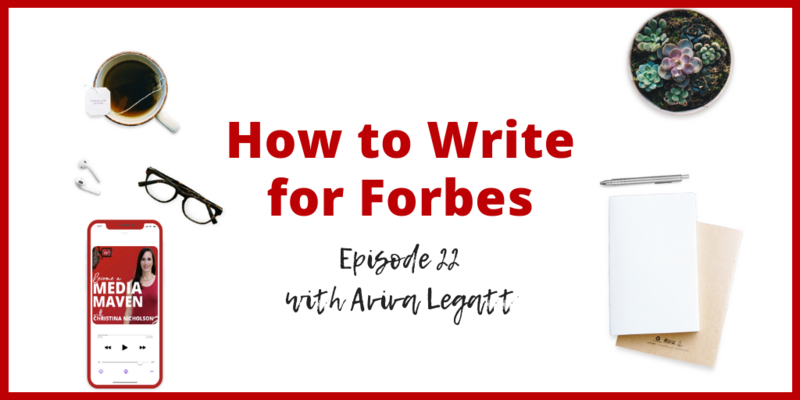 In this episode, Aviva is going to share how she earned her column in Forbes and how you can also take steps to become an online contributor like her. You will also learn how to make content marketing part of your marketing strategy, why outlets are looking for people like you to become contributors, and how you can turn your role as an online contributor into business. I am the person who you go to when you are wanting to stand out for your top elite college in the world. So, I help students and families from all over the United States and all over the world get into their top college and feel really good about their plans. And how did you get into this industry? Well, it’s an interesting story, Christina, because I had a crazy college process myself. When I was in high school, I didn’t have any help. I ended up getting really sick my senior year I got pneumonia from being so stressed about this process. So, I always had in the back of my mind that I wanted to help other people find a better way. And along that road, I ended up acquiring the expertise that you might look for in a college counselor. I was on the ward and undergraduate admissions committees for freshmen and transfer students. I have all my degrees in higher education, a doctoral degree as well. So really, I sort of ended up getting my mind in line with my heart through my education. And for the last five years, I’ve been helping people one on one and it’s been a really rewarding experience. Awesome. Okay. So when it comes to your reach outs, and I know we talked about this a little bit when we were working together in my program, even though what you do is for the kids, your customer is really the student’s parents. Exactly, and that’s where having the Forbes column has come in handy because I can talk about higher education trends and things happening and admissions to the parents who are reading Forbes. 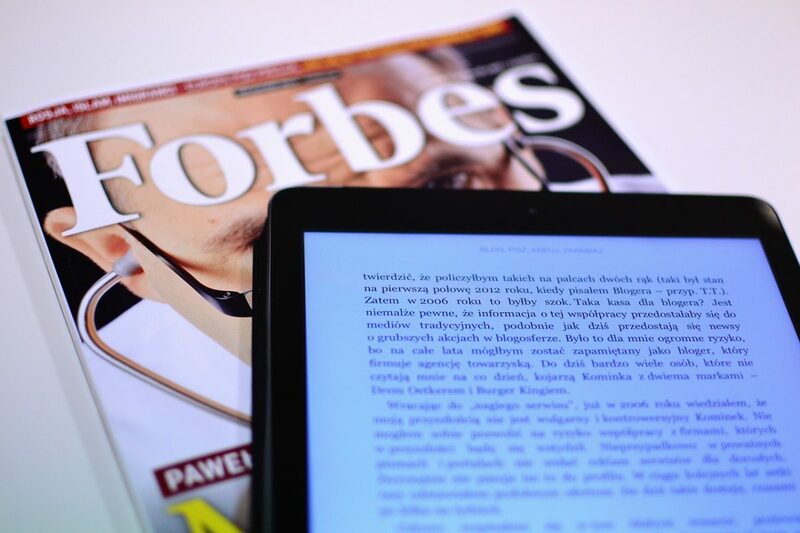 Some of my students read Forbes as well because a lot of my students are very entrepreneurial and business-minded, but really it’s mostly the parents who are reading Forbes and are looking for different current events and issues in the field. Contributing to outlets is so big and so important for people and a lot of the times when we think about getting more exposure in the media, we’re thinking about somebody being interviewed for a quote or some information in Forbes or something on local TV or the local newspaper. I feel like contributing for an outlet is something that a lot of people overlook and they don’t really understand the value of it. So that’s why I wanted to have you on because you don’t just contribute to Forbes but you actually leverage what you’re doing at Forbes to build your business in a variety of the ways. You’ve actually made it a really successful part of your marketing strategy. How does somebody get to contribute to a huge outlet like Forbes? Take us back and tell us how that happened. A lot of people are looking to contribute to top publications and you brought up a point about the value of contributing in publications as part of your strategy. I couldn’t agree more, and for me, it’s the opportunity to spread my ideas and to research and write about things I’m interested in and also to meet people who share interests with me. In terms of how I got started, I had made content marketing a big part of my strategy a couple of years ago. I had a chance to take a course and one of the pillars that she teaches about is your content and how you want to write about your ideas in order to get them out there. I had been doing that both for my own site and as a guest blogger for different websites. One of my contacts through the course ended up introducing me to a Forbes contributor who had a blog outside of the Forbes website where she was building her own business and content strategy as a side hustle. So I contributed an article to her site and when her editor went looking for contributors, she went on the website of this person who was a Forbes contributor and found my article and ended up reaching out to me for conversation. Well, five minutes into the conversation or perhaps even less, she just asked me to contribute and I didn’t even have to pitch or apply or anything because she already saw that I was a good writer and that I was an expert in the subject. So she happily had me on because Forbes needs people to contribute to their site because that’s their business model. They either pay very little or nothing depending on people’s contract with Forbes for content and they get a ton of viewership because they do have such great people writing such great content. I feel like I was really lucky, but I also know that I worked hard to put myself in that position to connect with the right people beforehand that led to that offer. If you have a chance to connect with a Forbes contributor that’s really the best way to get into Forbes or perhaps any other publication because then you get the direct intro to the editor or editors who are getting pitched a million times a day, whether it’s a story or ‘I want to contribute’ or ‘I want to be quoted in this article’. If you can just get that direct connection really the best way to get into Forbes or any other publication. Something that I really want people to take from that is that you were already creating your own content. They already knew you were a great writer and that’s what made it easy for you. I find so many people, they don’t want to focus on their own content, they just want it to be in other places, which yes, that’s important. But you also need something to share with those people. I’ve written for Inc. and Fast Company and when I was first talking to an editor about contributing, they wanted to see other work, so I had to send them stuff from my LinkedIn or my blog. I mean we all have to start somewhere, so it’s definitely important to be creating content for your own media before it goes on somebody else’s platform. I also wanted to ask you about this. So there is another client in my media mentoring program and she had an opportunity to contribute an article to Mind Body Green, which is a huge outlet. It’s perfect for her audience and she did not want to do it, and I was telling her, ‘no, no, no, you have to do this because so many people will see this and not only that, but you can tell people you are a contributor to this huge outlet and it does wonders for your credibility and your authority’. And her response was, ‘I don’t want to work for free’. And it drove me crazy when she said that because I was like, ‘no, no, no, you’re not looking at this the right way’. So what is your reaction when I tell you that? I can definitely appreciate her reaction as a business owner. It’s not easy to find time to write for free if you make money doing other things, but really what writing in Forbes or you know, Mind Body Green in this case. It’s an investment in your business and it’s so much more valuable than advertising. So yeah, you could go spend a thousand dollars on an ad or you can take a day out of your business and write the article, whatever that article is. I think it’s absolutely a valuable thing to do. I think it’s just something you have to make time for. You have to make yourself a client in your own business. You can’t ignore your own growth as an entrepreneur and favor of other people. So whoever this is, I would encourage them to think about how they could grow their business from this, what might they write about, where they could see the direct impact of that, and the direct benefit of it. I can’t always choose topics that aligned directly with my business, but a lot of the times I can and then I will be talking directly to my audience who would be interested in buying from me and that’s a great position to be in. And so I would encourage anyone who has that opportunity to take advantage of it, even if you don’t want to be a regular contributor, at least to do that one guest posts would even still be valuable. Tell me how you fit it in your schedule. We’re both business owners, were both moms, we both have a lot of things going on, so tell me how you fit this in your schedule because it can become overwhelming. I know at Inc. I was doing four articles a month and that was on top of some other outlets I was contributing to. So how do you make time to do it? I mean, I know I scheduled things and I use my Google calendar like it’s a bible. So how do you do it? For this answer and a lot more on how to write for Forbes to boost your authority and skyrocket your visibility, click here and listen to the full podcast.